I wrote the stalking of Rosa Czekov some years ago but have edited and polished it at various times; Rosa is one of my novels that I have sent off on numerous occassions to editors and agents without success. I have faith in my story though, and I think it deserves a wider audience. I can’t tell you exactly how long it took to write, I was working at the time and had a young family, so I guess it was probably about a year to complete the first rough draft. Now I am focussed on my audience and I can’t rely on anyone other than myself to edit it, it’s all down to me. I have re-read the whole of the novel, making only a few alterations, mainly grammatical and punctuation as I went through it. As usual I have overwritten and it’s far too long at 180,000 words so I am having to take the pruning shears to it quite severely! I am on my second reading and the secateurs are sharpened; in order to try to be objective I am reading the story out loud as if to an audience, and even though my listeners are only imaginary they are very helpful in the process. Their raised eyebrows, their ‘tuts’, their sighs are a great guide to where I am being repetitive and verbose. I have managed to lose nearly 3,000 unnecessary words and already feel that my work is tighter and slicker. Some of the action takes place in the imaginary village of Oak, between Easthope and Strand in my fictitious world. Luka and Rosa Czekov live in a house opposite a pub called the Old English Gentleman. 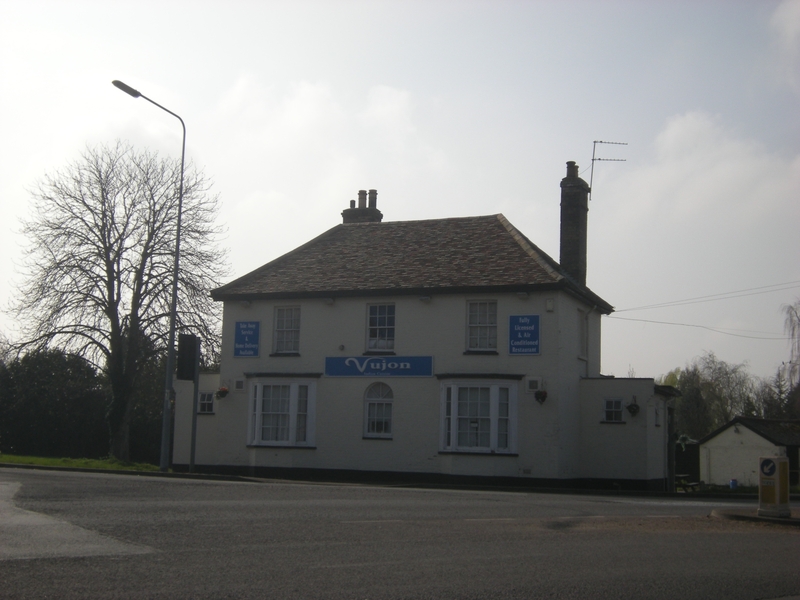 There was such a pub as this in a village near Harston in Cambridgeshire. My grandparents lived opposite it more than fifty years ago and there are various family stories connected with it. The actual Old English Gentleman no longer exists, it is now a restaurant, pictured above. My readers will have to imagine that there is a door as there used to be between the two large front windows, where there is now only a small arched window beneath the restaurant’s name. The real pub (now restaurant) is at an angle to the main road, but in my story it is facing Rosa and Luka’s house; it is their local, and the landlord is a very close friend of theirs.